The Quality-Adjusted Life Year (QALY) is a measure of the value and benefit of health outcomes. The QALY is an attempt to combine these two attributes into a single figure/number. QALY gives an idea of how many extra months or years of life of a reasonable quality a person might gain as a result of treatment (particularly important when considering treatments for chronic conditions). To calculate the QALY, the following formula can be used; this assumes a utility value (quality of life) between 1 = perfect health and 0 = dead. 1. If an individual has perfect health for a period of 1 year, they will be said to have 1 QALY. 2. If an individual lives in perfect health but only for half a year, that individual will have 0.5 WALY. QALYs are used to quantify the effectiveness of a new treatment (eg. new medication) compared to the current treatment for a particular condition. QALYs can also be used to compare the health benefit of a new treatment for one condition with the health benefit of a new treatment for a different condition. For instance, the QALY permits comparison of a new cancer therapy with the health effect of a new Parkinsons medication. QALYs can also be used to evaluate the cost effectiveness of a treatment, that is how much the drug or treatment costs per QALY. This is the cost of prescribing a drug to provide 1 year of the best quality of life available, and it is expressed as "£ per QALY" or "$ per QALY" etc. Thus QALY estimates are able to integrate both psycho-social and biomedical aspects of the burden of a disease. QALYs have limited value were quality of life is a major consideration but survival is not - making the QALY of limited use in evaluating te effects of many chronic but not fatal diseases. Generally speaking, younger, healthier groups of people will have many times morre QALYs than groups of older, more infirm individuals. 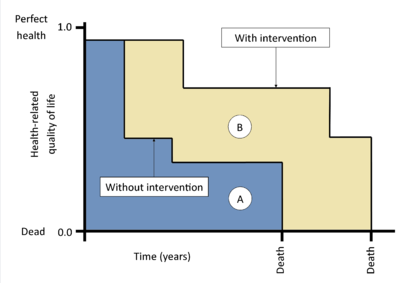 Therefore, QALY calculations may undervalue treatments which benefit the elderly or other groups with a lower life expectancy.